The first restaurant that I ventured to after I had become bored of SFU's campus food was Sushi Town. At that time, I was aware that Hong Sushi was even closer to campus than Sushi Town. However, I ended up going to Sushi Town because it seemed the more popular of the two, and more importantly, I was too lazy to cross the street prior to eating. Hong Sushi ended up in my list of restaurants I wanted to try but forgot to, until Jeff from my office mentioned how he used to regularly order their very cheap and filling combo: 18 pieces of sushi + miso soup for just $6.95 (now $7.95). 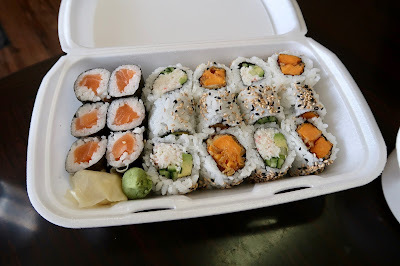 Thus, the two of us went to Hong Sushi during one of our lunch breaks to try out their $6.95 combo among other things. 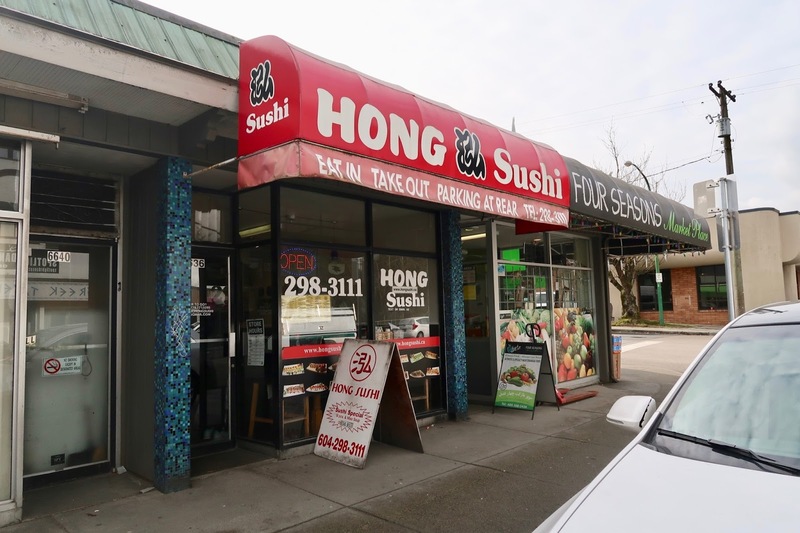 Hong Sushi is Chinese-operated, and although it is rather small in physical space, its menu is not small at all. There were enough appetizers and special rolls to give me a hard time deciding how to construct my ultimate tasting experience. 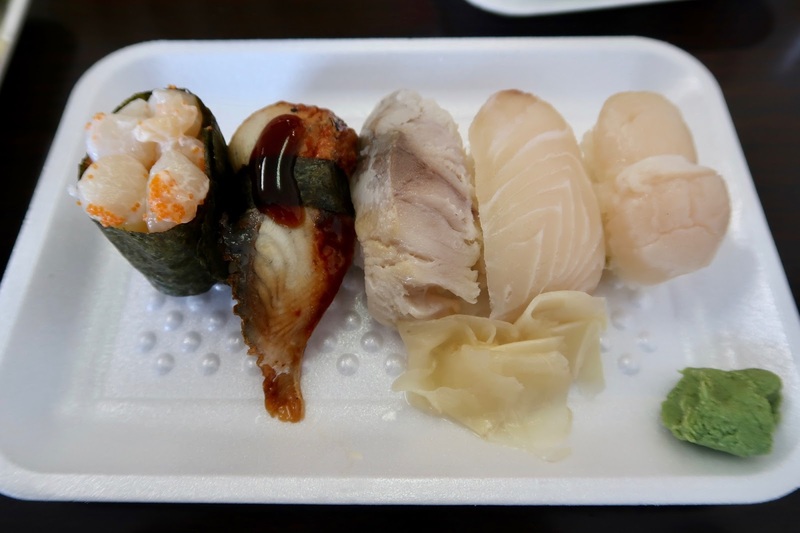 One notable thing about Hong Sushi is that they serve everything on foam dishes, which complements their budget-friendly focus. Another notable thing about the restaurant is that you order using tablets (there's one at each table). 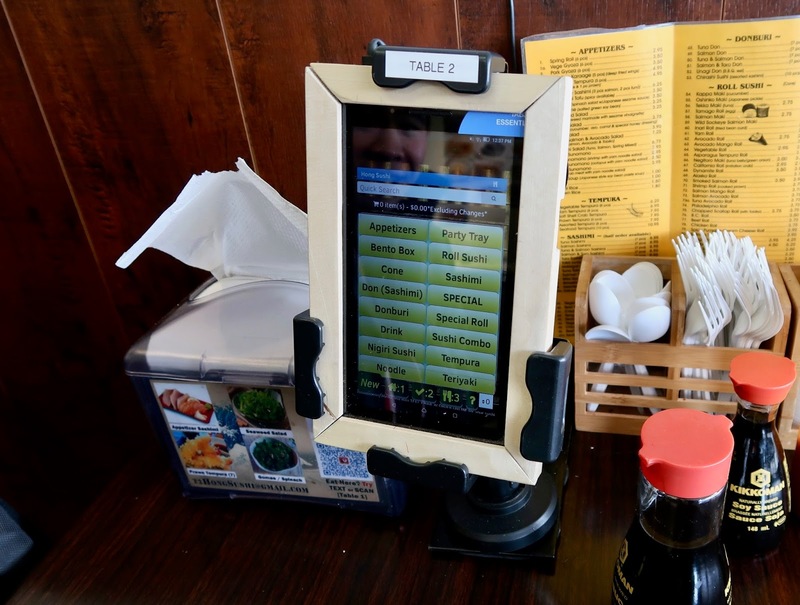 Given the low volume of dine-in customers, I'm not sure if the tablets really contribute to improving the restaurant's efficiency. However, they are great if you find human interaction terrifying and are mortally afraid of actually having to talk to a server. The $6.95 combo comes with a Salmon Roll, a California Roll, a Yam Roll, and a bowl of miso soup (not pictured). The rolls turned out better than I had expected. 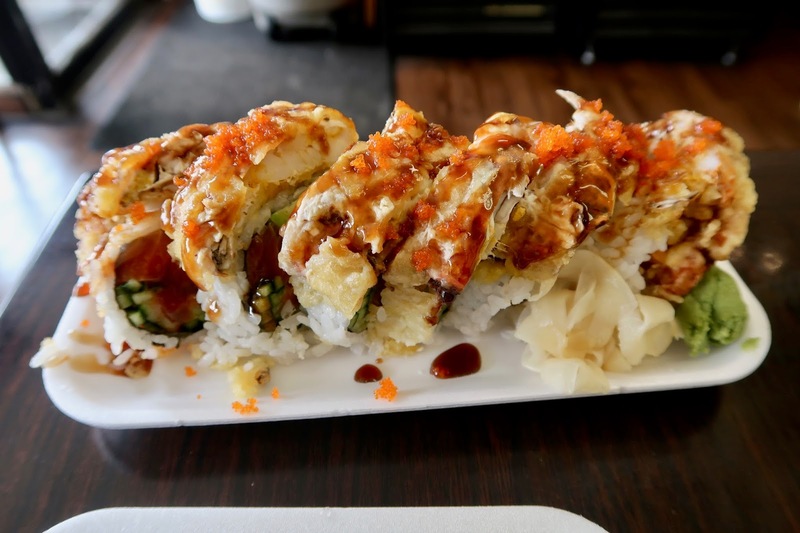 The California Roll featured sweet imitation crab, while the lightly fried tempura yam in the Yam Roll had a decent amount of crispiness. The Salmon Roll came with fresh, buttery salmon, although we thought the sushi rice could have been a little more flavourful. All three rolls were neatly constructed and came in rather large portions. 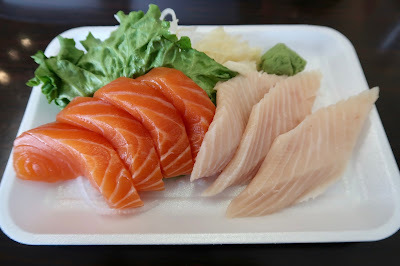 Next up, the Salmon Sashimi was creamy and buttery and came in neatly cut, generous slices. I also liked how the pieces were not too thickly sliced. The toro did not fare as well, as it was slightly fishy and not especially melty. 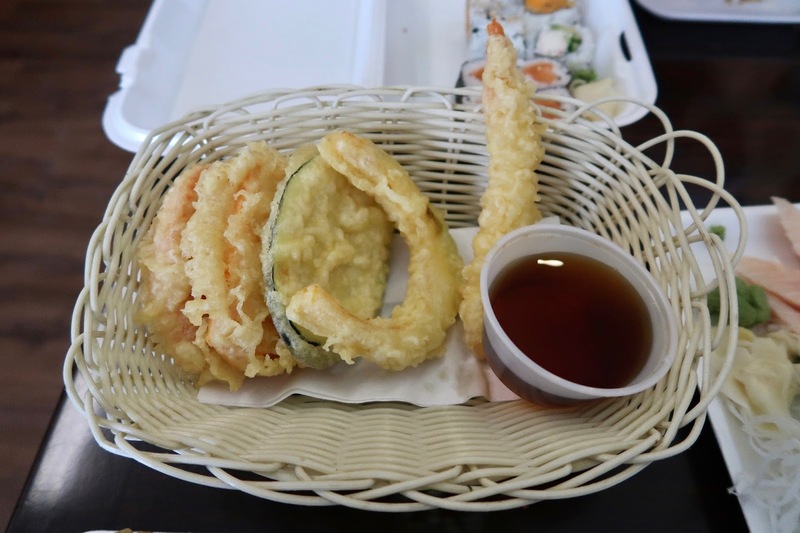 The Appetizer Tempura came with one prawn and one piece each of kabocha, zucchini, sweet potato, and carrot. 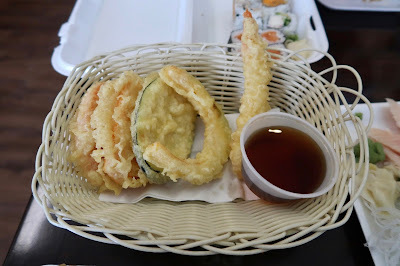 Some of the vegetable tempura was well-prepared and turned out savoury and juicy. However, the batter tended to be quite thick. Next, we had the Scorpion Roll, a massive roll with deep-fried prawn, spicy tuna, salmon, cucumber, imitation crab meat, soft shell crab tempura, and masago. Despite their colossal size, the individual pieces actually held together quite well. The soft shell crab was remarkably well-prepared and contributed a nice crispiness to the roll. The spicy zing from the spicy tuna also went well with the other savoury ingredients in the roll. After our large roll, I was presented with some rather large nigiri. The nigiri were more about size than quality. The sushi rice was dry and too tightly packed. However, some of the toppings were decent. The chopped scallop had a pleasant, creamy sweetness, while the unagi was soft and dressed with ample sweet unagi sauce. The saba was too salty and not smooth in texture, while the tai and hotate lacked flavour. The service was very minimal, as the server seemed to expect us to interact with the tablets more than himself. However, the food was decent given the budget prices. Hong Sushi is not a place I would frequent, but it is a place I can fall back on if I ever felt the need for a change of taste from the other budget sushi restaurants on Hastings.